Here’s three more – it’s kind of like mushrooms growing in the forest. What possessed the owner to hold on to these? 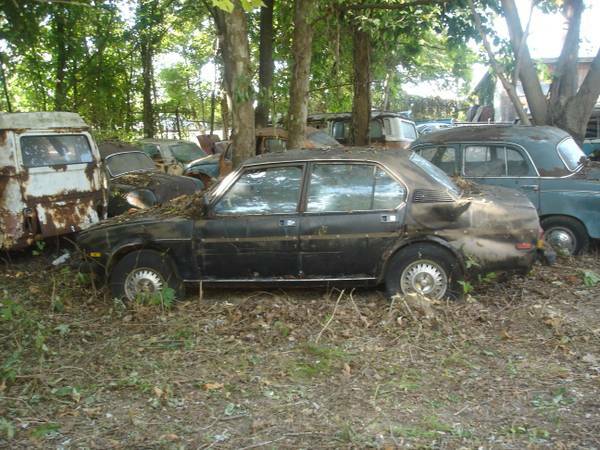 The nearest one looks like it caught fire at some point, with the rust pattern. There are also some buses in the immediate area, as well as some W114/115 Mercedes sedans, and some Ponton Mercedes. None of them look particularly usable, except for parts and scrap. 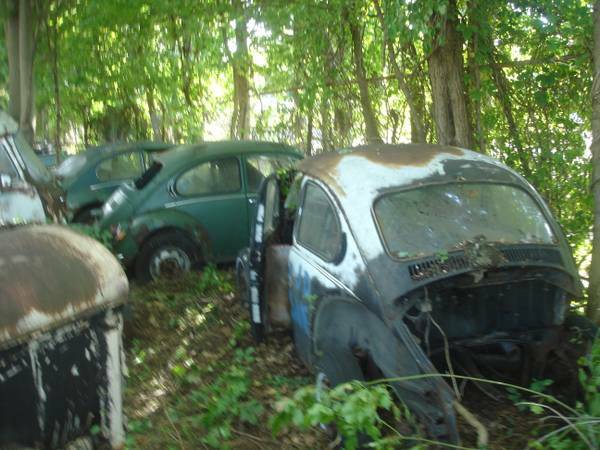 Okay, so Beetles are pretty ubiquitous, and there’s plenty more where that came from, but leaving an Alfa Spider under the trees? Oh wait, there’s a lot of those too… what took this car down? Turbina wheels and glass are still good. You can see a Mercedes sedan in the background, so who knows what else he (let’s face it, it’s always a “he”) has out there. Perhaps there are some 356 remnants for which he can squeeze $50K out of someone who hasn’t heard of the tulip bubble. 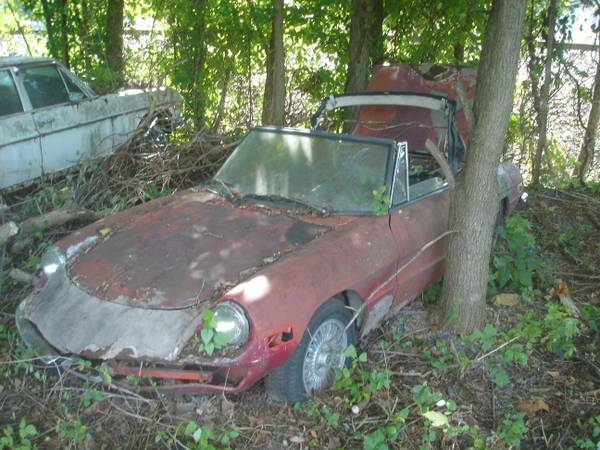 You can find the Alfa Romeo Spider and Alfa Romeo Alfetta for sale in Ranson, WV, and again, if you have to ask, you can’t afford these fine examples of Italian ferrous oxide. Saving the worst for last – this Alfa Romeo Alfetta Sedan, clearly a later car with the flush door handles, and probably a 1979 because of the side markers. 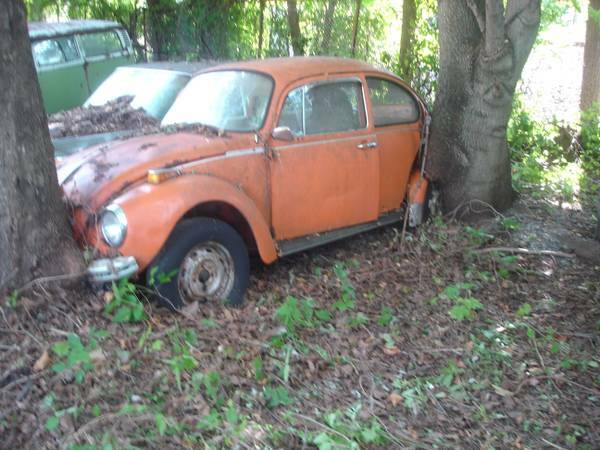 The seller must have cared more about this car, because it’s free of trees. Perhaps inflating the tires might yield you a roller. This is probably too far gone anyways, but you might get a few useful parts off it. Mercedes ponton sedans, VW buses, and more that’s not easily recognized is in the background. This entry was posted on January 19, 2014 at 6:18 pm and is filed under Feature. You can follow any responses to this entry through the RSS 2.0 feed. You can leave a response, or trackback from your own site. Wow, and one is a convertible bus? That’s even better than those silly 21-window things everyone is paying through the nose for.